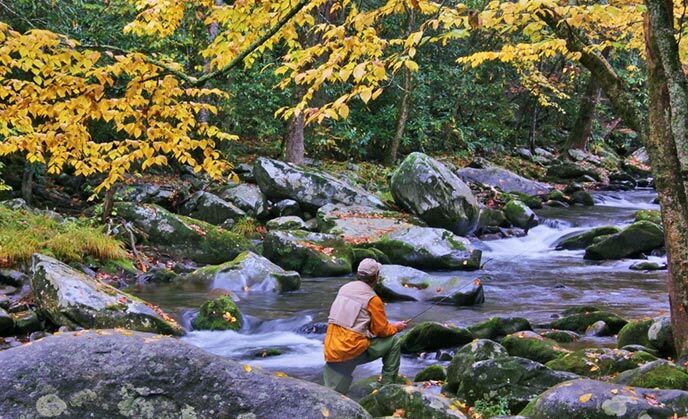 Fishing has been a part of the historic use of the Great Smoky Mountains National Park since its creation. The native brook trout was originally present in most streams above 2000 feet elevation. Extensive logging operations in the early 1900s caused contamination of over 160 miles of clear mountain streams, eliminating the brook trout from about 50% of its original range. Persons possessing a valid Tennessee or North Carolina fishing license may fish all open park waters. A license is required of all persons age 16 or older. Persons under age 16 are entitled to the daily adult bag and possession limit, and are subject to all regulations. Senior citizen licensing is available. The Park does not sell fishing licenses. Licenses are obtainble in surrounding communities, outside the park or click HERE. Fishing is permitted year-around in open waters. Fishing is allowed from one half hour before official sunrise to one half hour after official sunset. Limit: 5 fish per day, 7" minimum length, single hook artificial lure only, trout per permit holder (includes catch of children fishing under a supervising adult's permit). Twenty rock bass may be kept in addition to the above limit. For detailed information about size limits, bait, and regulations, click HERE or call (865) 436-1200.